I was planning on making a scrappy string quilt, but realized today while going through my scraps that I have many large scraps. I mean like 1/4 to 1/2+ yard scraps and am thinking I really don't want to cut these large pieces into thin strips. So, my question is, what's a good pattern for large scraps? I am thinking of maybe ordering the large Tumbler Template from MSQC, I have the one for 5" squares and the mini one, so could do something with the 3 of them? Pulled a few fabrics out and am going to make some tote bags and library bags for some great nieces. Forgot I even had some of these fabrics.....cute stuff! Maybe a disappearing 9 patch. I made a completely scrappy one and it was very pretty. Lots of free patterns/directions if you do a google search. Double Slice Layer cake from MSQC. Or any pattern that uses the layer cakes. Turning Twenty patterns. Fat quarter patterns. Lots to choose from. 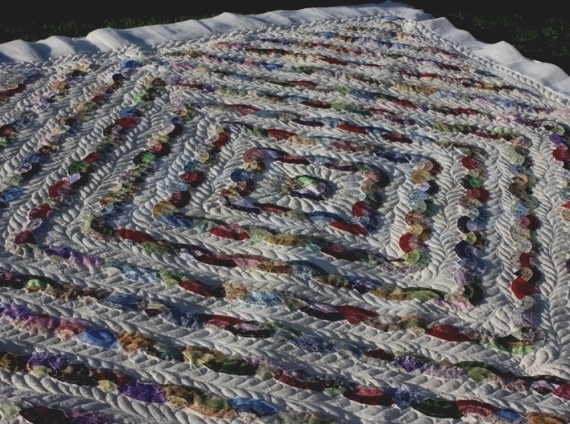 I was also thinking of the Turning Twenty, and I agree that Bonnie Hunter probably has some great ideas for large scrappy quilts. String quilts are my favorite scrappy. You might consider sewing your larger scraps end-to-end (side-by-side?) and then cutting the result into strings. I have seen some beautiful scrappy Log Cabin quilts. Majestic mountains is a great pattern for large scraps. Use the small scraps for piecing the top - use the large fabrics for the backing. Also, I have the large tumbler and love it! I think I saw a picture of a quilt where they alternated the size of the tumbler form one row to the next. You could always end the rows with a partial tumbler the same fabric as the border so you could keep the tumbler shape on the ends that way. Then just clean up the ends of the row before adding the borders. I only had to use the seam ripper 3 times in my first tumbler quilt. Then I got the hang of lining the blocks up. I figured out that if I fingered pressed the seam on the top piece, I could line it up, pin it, then sew the seam. Just remember - tumpler blocks have biased sides so no pulling on the edges. I ended every row with a tumbler block that I cut down the middle and that middle edge would be on the end of the row so no stay stitching required. 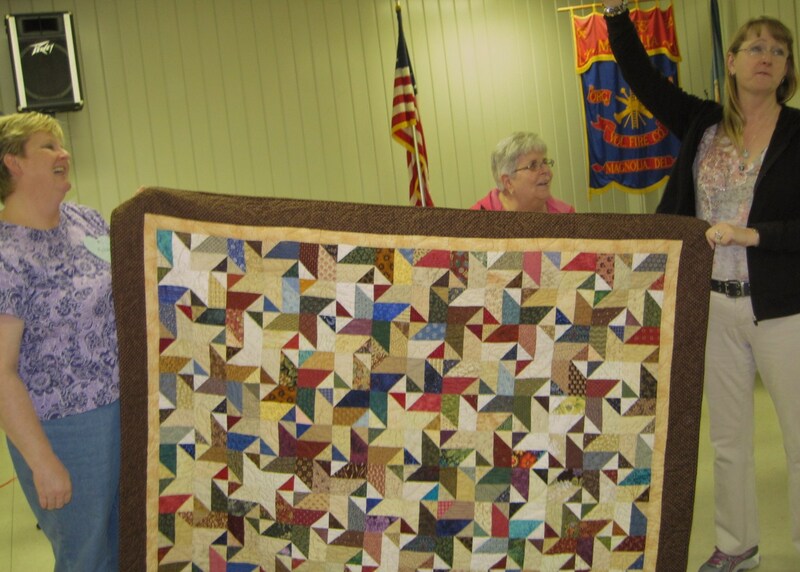 Please show us a picture of your finished quilt - I bet it's gorgeous! I love scrappies! I have a queen size on my bed that my step mother made for us about 25 years ago. DS9 patch is so simple, easy and quick!! Great idea for using up those larger pieces. Good Luck !! i use Elanor Burns large flying geese ruler for those large scraps. It uses them up and I have FG or Ohio Stars or half a dozen other traditional patterns that use FG units. THEN I make string quilts with whats left. Recently there was a posting about patterns simular to a Yellow Brick road. That would work great with larger pieces an you can make it any size you like. Add my vote to Bonnie Hunter (quiltville.com) patterns. In addition to several books and her annual mystery, she has several free patterns available online. They are very thorough, with lots of photos to describe each step. 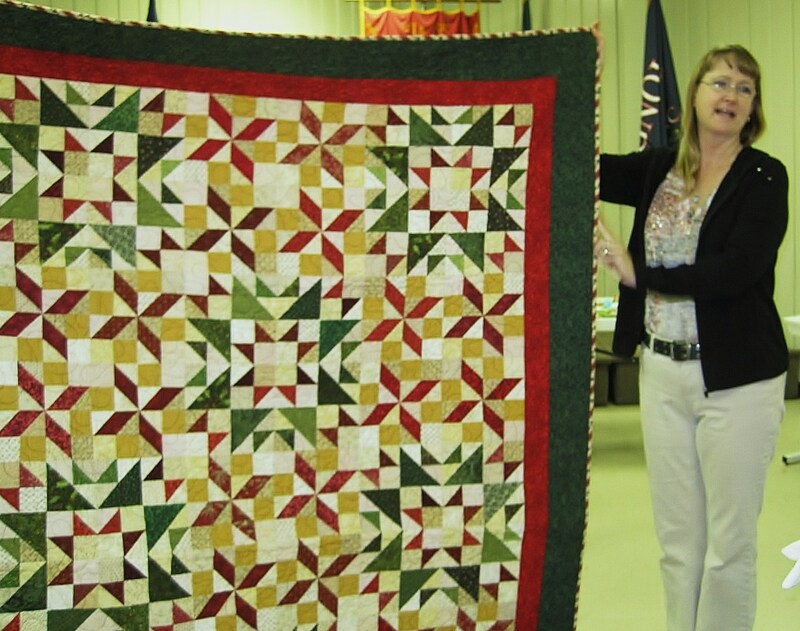 Although many of the quilts look intimidating, they are quite doable by following her detailed instructions. I've attached pictures of a couple of hers that I've done (Easy Street, her mystery from last Thanksgiving, just came back from the LA, so is not yet bound). 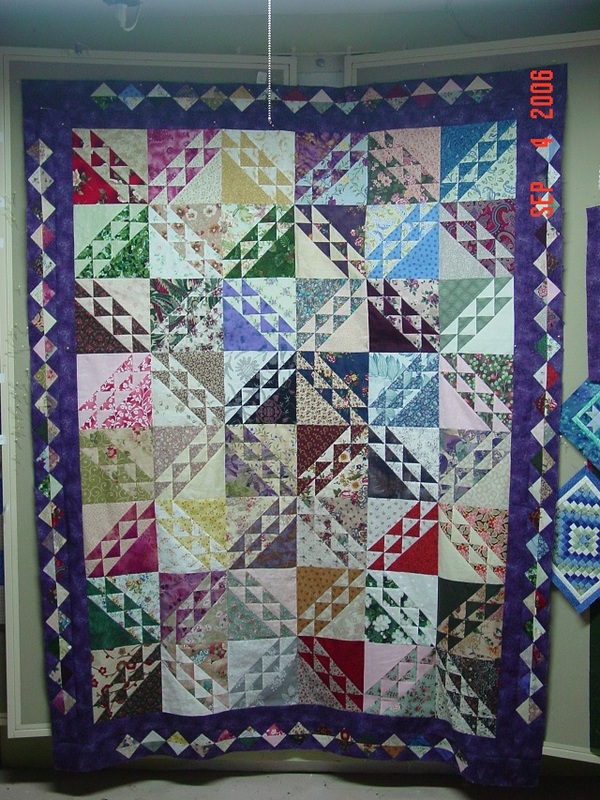 Sorry, should have mentioned - Although all are scrappy, in 1st (Carolina Christmas) and 3rd (Easy Street), I used strips cut per Bonnie's Scrap User's System as well as fat quarters. Variety is the spice of life, and of my quilts! Recently, I had to make a project using only 4 fabrics and not only found it difficult, I didn't care for the end result! Also love Joan Ford (Hummingbird Highway) patterns; she has two books on Scrap Therapy out, both of which are well worth it. Peace - I love the colors you've used in your Easy Street. Great work. I was a little intimidated when I first saw Bonnie's quilts. Thought they were too complicated with all those pieces. But it's more a matter of patience since most of the piecing is pretty simple. I've recently cut my tub of small sized scraps into strips and squares per Bonnie's system. Now I actually feel like I'll be able to use those scraps instead of saving them until the "right" project came along. I agree with Alien Quilter. 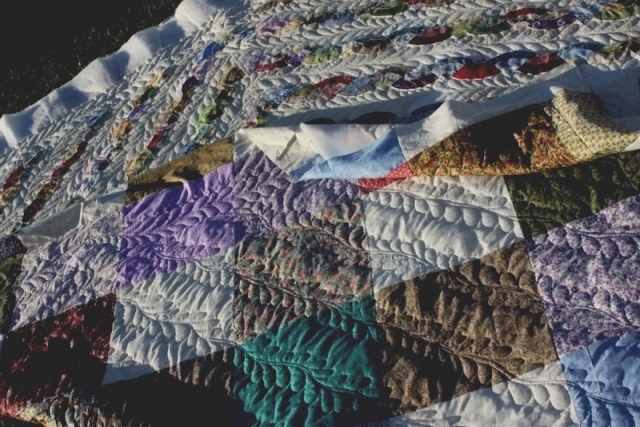 Large scraps are great for a scrappy quilt. At my house, anything 1/2 yard or more is considered yardage - not scraps - and is folded and put into plastic boxes as are my fat quarters. Turning Twenty is a good pattern. It wakes 20 fat quarters. Go to u-tube, check out 10 minute quilt blocks. They make up fast and look nice. Use any size block you want. She uses 10 inch and finished block is 18 in. 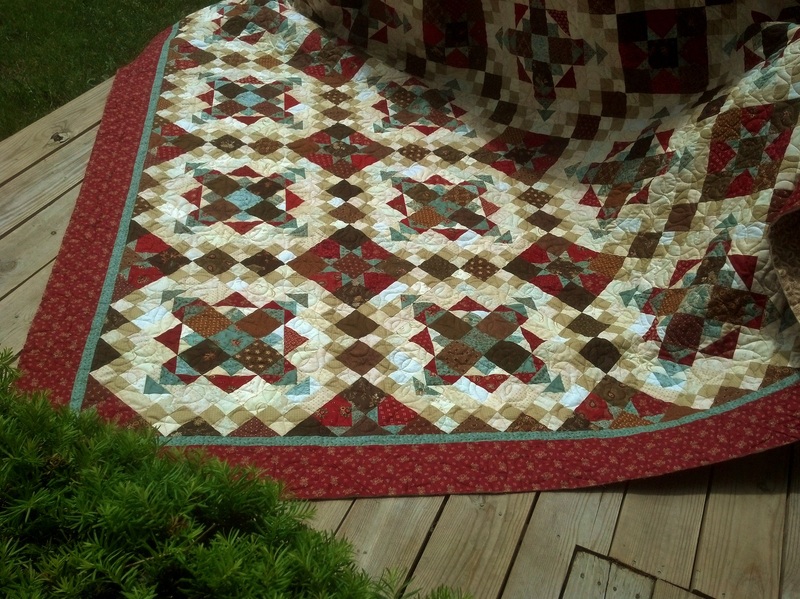 Bonnie Hunter's 4th of July is a quick, easy pattern using 3.5" and 6.5" squares. It's a small lap size. There are a few others in her free pattern section are pretty simple and/or small and don't use tiny pieces. I love scrappy quilts - will have to check out Bonnie Hunter - I've heard her name mentioned a lot! !